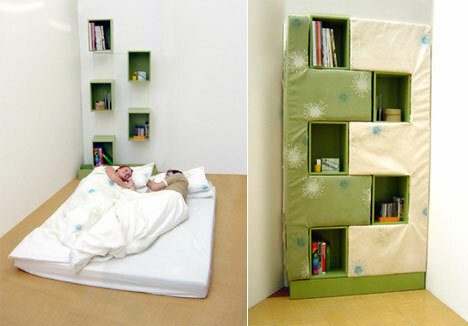 If you need something to store books anyway, why not choose something that makes a statement or serves two purposes like a bookcase or bookshelves that double as a secret door or a book shelf the is also a bed? Some of these creating and unique shelving systems are virtually invisible while others are virtual works of art in their own right. 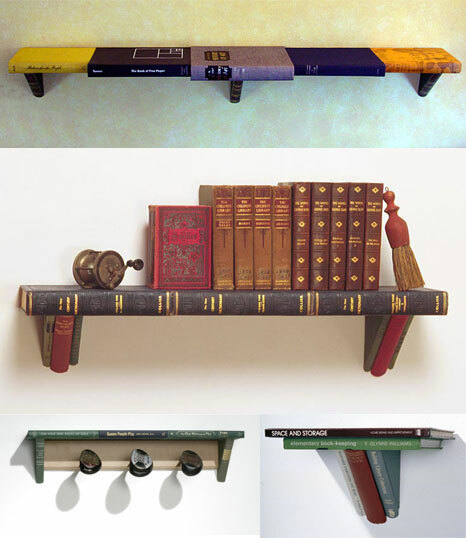 So, if you or a book-lover you know are stuck on how to redecorate your urban dwelling and store your favorite volumes here are twenty unusually clever book shelving solutions. 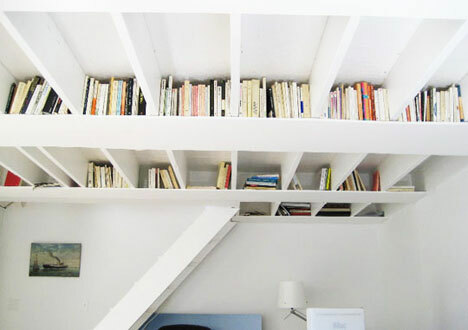 Stairs Bookshelves: What started as a space-saving strategy turned into a centerpiece of this interior redesign. The experience: complete book-overload as the London owners make their way to the loft bedroom above the main floor of their condo. Shot from virtually any perspective the result is remarkably attractive and a good reminder that a lack of space can be a great design opportunity. 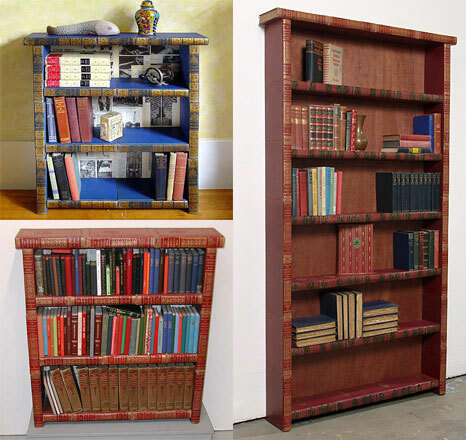 Bookshelves and Bookcases Made of Books: Jim Rosenau has a very particular (and peculiar) furniture-made niche related to his love of books: furniture (particularly shelves and bookcases) made of books. His work is sold around the country and the world and can be purchased online from his website or made-to-order. 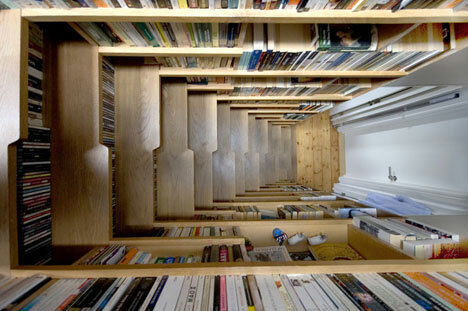 His past experience as a comedy writer and carpenter seem like as good a background as any for someone creating these clever and humorous bookshelves and bookcases. Bookcase Bedroom: Most parents want to surround their children with books, but most don’t take that advice quite so literally. This bookcase bedroom designed by Point Architects in Tokyo is a great example of a Japanese approach to space-saving interior design: why have walls or bookshelves when you can have both in one? 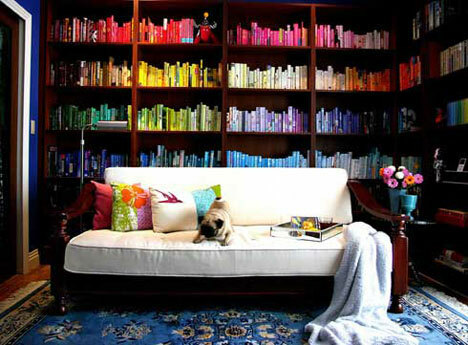 Color-Coded Books: This amazingly organized color-coded bookshelf arrangement is a great example of how not only bookcases but the books stored in them can be decorative. 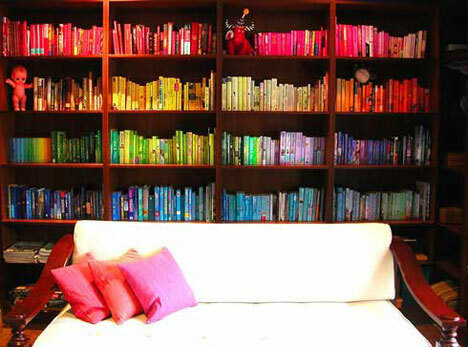 Can you imagine the time, energy and dedication it would take to meticulously sort your entire book collection by color? And worse yet: what do you do when you have to add another book to your collection? 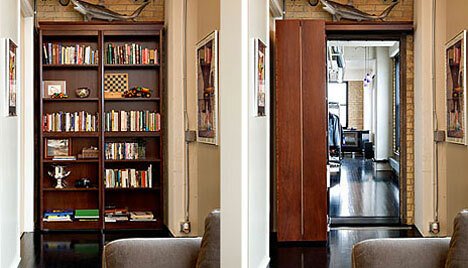 Bookcase Door to Hidden Room: We’ve all seen it in the movies: you pull the book from the shelf and the mysterious door opens into a secret room to the side. 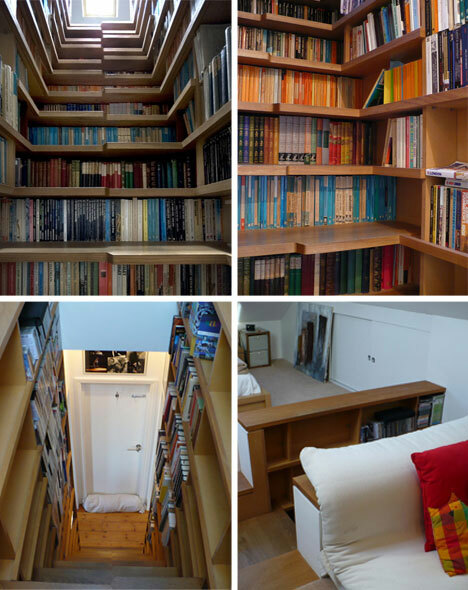 Well, this isn’t a mansion in a murder mystery – just someone’s house – but when they were renovating they wanted maximum book storage but to get it they had to obstruct a door. Instead of an ungainly workaround they simple bookcased over the door and made a secret one instead. Bookcase Door: Besides one-off secret-room bookcase doors there are entire design firms and creative interior design lines dedicated to dual-functioning bookcases. The Woodfold Bookcase Door System is designed to camouflage anything from a closet or a wine cellar to a wall safe or a private retreat. Rafter Shelving System: Exposed rafters can be a nice touch visually but if you’re living in cramped quarters you know that every bit of usable space has surprising potential. This is definitely a simple solution and easily executed by one that provides great overflow space for anyone who finds it hard to throw old books away. 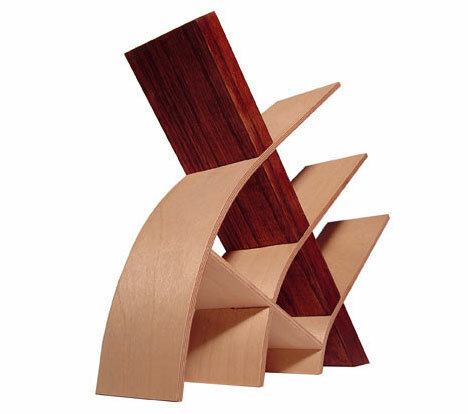 Hanging Bookshelves: This book hanger system is designed with style and materials clearly in mind. 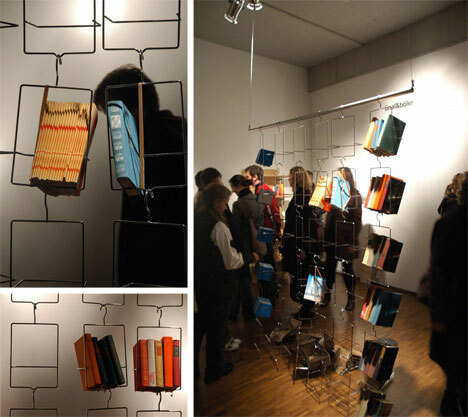 The concept is to have books hanging like clusters of grapes that sway with any movement and can be casually plucked by people passing by. The overall aesthetic impression is one of fragility, reflecting the delicate nature of old books and running contrary to the traditional idea of bookshelves and bookcases as some of the heaviest objects in a room. Bed Bookcase: While not everyone may find the results attractive the concept behind this convertible bed-and-bookcase design is an admiral start anyway. 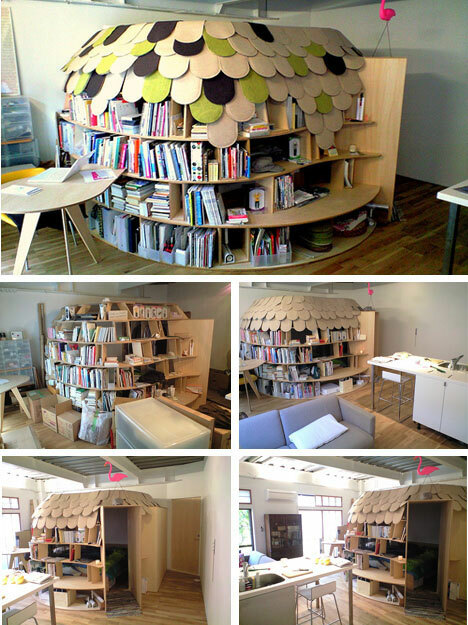 As a space-saving device this would be a great way to keep an extra bed around and then let it blend into the background, wrapped around bookshelves, when not in use. 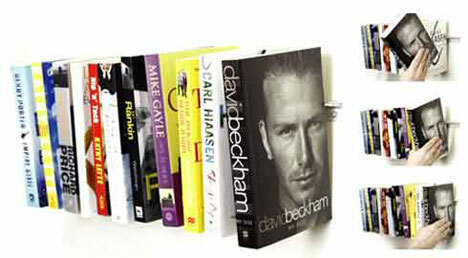 Invisible Bookshelf: If you really want to wow your guests an invisible shelf system might be just the solution. Talk about minimalist design: once your books are in place the support seems to disappear entirely. However, since hidden grips hang onto the insides of your books you might want to use this solution primarily for throw-away paperbacks and magazines. 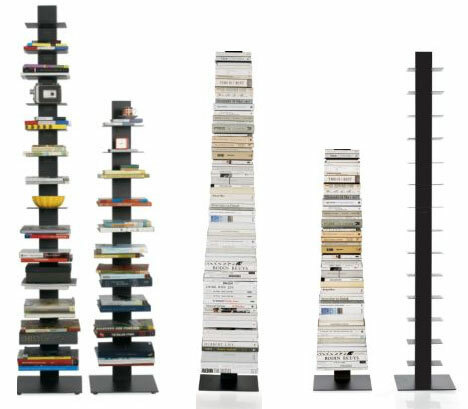 Invisible Bookshelf Stacks: While these shelves are quite visible when bare, once they are filled up they all but disappear. The resulting effect is the appearance of a disturbingly tall stack of seemingly unsupported by anything but the books of which it is composed. This has quite a lot of potential entertainment value: sit back and watch your visitors bump into one and leap into action trying to keep it from toppling (which it won’t). 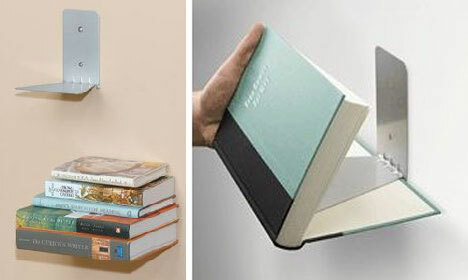 Floating Bookshelf : Available for around 10 dollars from Amazon this simple-but-clever invisible bookshelf design is definitely priced right. The appearance? Books seem to hang invisible along the wall, stacked apparently on nothing. The trick? The bottom book isn’t real and supports the rest. 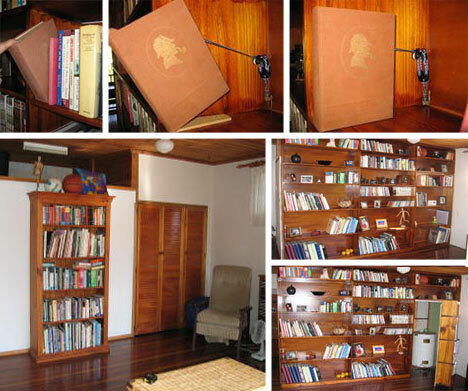 DIY Bookcase: Don’t want to spend all that money on a fancy bookcase? 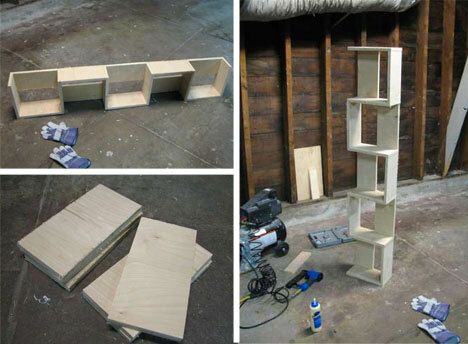 Someone submitted a 60-minute do-it-yourself bookcase design-and-construction process to Instructables worth checking out. Sure, the joinery is pretty low-tech and the material is plywood but for a cheap shelving solution built from a single piece of ply in an hour the result is surprisingly sophisticated. Gravity Bookshelves: While this wonderful bookshelf system is not yet in production it is an excellent example of how a few well-chosen materials and a minimal number of cuts can go a long way. This apparently complex and visually compelling shape is held together entirely by gravity – a great example of modernist interior design principles of simplicity and structural honesty loosely translated into a far-from-simple form.